One reason why mathematics enjoys special esteem, above all other sciences, is that its laws are absolutely certain and indisputable, while those of all other sciences are to some extent debatable and in constant danger of being overthrown by newly discovered facts. In spite of this, the investigator in another department of science would not need to envy the mathematician if the laws of mathematics referred to objects of our mere imagination, and not to objects of reality. For it cannot occasion surprise that different persons should arrive at the same logical conclusions when they have already agreed upon the fundamental laws (axioms), as well as the methods by which other laws are to be deduced therefrom. But there is another reason for the high repute of mathematics, in that it is mathematics which affords the exact natural sciences a certain measure of security, to which without mathematics they could not attain. In my opinion the answer to this question is, briefly, this:—As far as the laws of mathematics refer to reality, they are not certain; and as far as they are certain, they do not refer to reality. It seems to me that complete clearness as to this state of things first became common property through that new departure in mathematics which is known by the name of mathematical logic or “Axiomatics.” The progress achieved by axiomatics consists in its having neatly separated the logical-formal from its objective or intuitive content; according to axiomatics the logical-formal alone forms the subject-matter of mathematics, which is not concerned with the intuitive or other content associated with the logical-formal. Let us for a moment consider from this point of view any axiom of geometry, for instance, the following:—Through two points in space there always passes one and only one straight line. How is this axiom to be interpreted in the older sense and in the more modern sense? The older interpretation:—Every one knows what a straight line is, and what a point is. Whether this knowledge springs from an ability of the human mind or from experience, from some collaboration of the two or from some other source, is not for the mathematician to decide. He leaves the question to the philosopher. Being based upon this knowledge, which precedes all mathematics, the axiom stated above is, like all other axioms, self-evident, that is, it is the expression of a part of this à priori knowledge. This view of axioms, advocated by modern axiomatics, purges mathematics of all extraneous elements, and thus dispels the mystic obscurity which formerly surrounded the principles of mathematics. But a presentation of its principles thus clarified makes it also evident that mathematics as such cannot predicate anything about perceptual objects or real objects. In axiomatic geometry the words “point,” “straight line,” etc., stand only for empty conceptual schemata. That which gives them substance is not relevant to mathematics. Yet on the other hand it is certain that mathematics generally, and particularly geometry, owes its existence to the need which was felt of learning something about the relations of real things to one another. The very word geometry, which, of course, means earth-measuring, proves this. For earth-measuring has to do with the possibilities of the disposition of certain natural objects with respect to one another, namely, with parts of the earth, measuring-lines, measuring-wands, etc. It is clear that the system of concepts of axiomatic geometry alone cannot make any assertions as to the relations of real objects of this kind, which we will call practically-rigid bodies. To be able to make such assertions, geometry must be stripped of its merely logical-formal character by the co-ordination of real objects of experience with the empty conceptual frame-work of axiomatic geometry. To accomplish this, we need only add the proposition:—Solid bodies are related, with respect to their possible dispositions, as are bodies in Euclidean geometry of three dimensions. Then the propositions of Euclid contain affirmations as to the relations of practically-rigid bodies. Geometry thus completed is evidently a natural science; we may in fact regard it as the most ancient branch of physics. Its affirmations rest essentially on induction from experience, but not on logical inferences only. We will call this completed geometry “practical geometry,” and shall distinguish it in what follows from “purely axiomatic geometry.” The question whether the practical geometry of the universe is Euclidean or not has a clear meaning, and its answer can only be furnished by experience. All linear measurement in physics is practical geometry in this sense, so too is geodetic and astronomical linear measurement, if we call to our help the law of experience that light is propagated in a straight line, and indeed in a straight line in the sense of practical geometry. 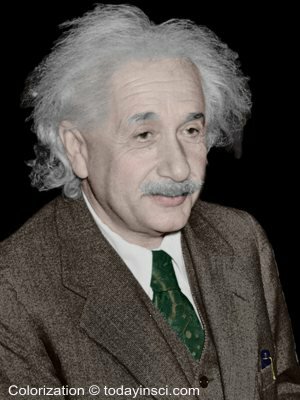 I attach special importance to the view of geometry which I have just set forth, because without it I should have been unable to formulate the theory of relativity. Without it the following reflection would have been impossible:—In a system of reference rotating relatively to an inert system, the laws of disposition of rigid bodies do not correspond to the rules of Euclidean geometry on account of the Lorentz contraction; thus if we admit non-inert systems we must abandon Euclidean geometry. The decisive step in the transition to general co-variant equations would certainly not have been taken if the above interpretation had not served as a stepping-stone. If we deny the relation between the body of axiomatic Euclidean geometry and the practically-rigid body of reality, we readily arrive at the following view, which was entertained by that acute and profound thinker, H. Poincaré:—Euclidean geometry is distinguished above all other imaginable axiomatic geometries by its simplicity. Now since axiomatic geometry by itself contains no assertions as to the reality which can be experienced, but can do so only in combination with physical laws, it should be possible and reasonable—whatever may be the nature of reality—to retain Euclidean geometry. For if contradictions between theory and experience manifest themselves, we should rather decide to change physical laws than to change axiomatic Euclidean geometry. If we deny the relation between the practically-rigid body and geometry, we shall indeed not easily free ourselves from the convention that Euclidean geometry is to be retained as the simplest. Why is the equivalence of the practically-rigid body and the body of geometry—which suggests itself so readily—denied by Poincaré and other investigators? Simply because under closer inspection the real solid bodies in nature are not rigid, because their geometrical behaviour, that is, their possibilities of relative disposition, depend upon temperature, external forces, etc. Thus the original, immediate relation between geometry and physical reality appears destroyed, and we feel impelled toward the following more general view, which characterizes Poincaré’s standpoint. Geometry (G) predicates nothing about the relations of real things, but only geometry together with the purport (P) of physical laws can do so. Using symbols, we may say that only the sum of (G) + (P) is subject to the control of experience. Thus (G) may be chosen arbitrarily, and also parts of (P); all these laws are conventions. All that is necessary to avoid contradictions is to choose the remainder of (P) so that (G) and the whole of (P) are together in accord with experience. Envisaged in this way, axiomatic geometry and the part of natural law which has been given a conventional status appear as epistemologically equivalent. Sub specie aeterni Poincaré, in my opinion, is right. The idea of the measuring-rod and the idea of the clock co-ordinated with it in the theory of relativity do not find their exact correspondence in the real world. It is also clear that the solid body and the clock do not in the conceptual edifice of physics play the part of irreducible elements, but that of composite structures, which may not play any independent part in theoretical physics. But it is my conviction that in the present stage of development of theoretical physics these ideas must still be employed as independent ideas; for we are still far from possessing such certain knowledge of theoretical principles as to be able to give exact theoretical constructions of solid bodies and clocks. Further, as to the objection that there are no really rigid bodies in nature, and that therefore the properties predicated of rigid bodies do not apply to physical reality,—this objection is by no means so radical as might appear from a hasty examination. For it is not a difficult task to determine the physical state of a measuring-rod so accurately that its behaviour relatively to other measuring-bodies shall be sufficiently free from ambiguity to allow it to be substituted for the “rigid” body. It is to measuring-bodies of this kind that statements as to rigid bodies must be referred. Not only the practical geometry of Euclid, but also its nearest generalisation, the practical geometry of Riemann, and therewith the general theory of relativity, rest upon this assumption. Of the experimental reasons which warrant this assumption I will mention only one. The phenomenon of the propagation of light in empty space assigns a tract, namely, the appropriate path of light, to each interval of local time, and conversely. Thence it follows that the above assumption for tracts must also hold good for intervals of clock-time in the theory of relativity. Consequently it may be formulated as follows:—If two ideal clocks are going at the same rate at any time and at any place (being then in immediate proximity to each other), they will always go at the same rate, no matter where and when they are again compared with each other at one place.—If this law were not valid for real clocks, the proper frequencies for the separate atoms of the same chemical element would not be in such exact agreement as experience demonstrates. The existence of sharp spectral lines is a convincing experimental proof of the above-mentioned principle of practical geometry. This is the ultimate foundation in fact which enables us to speak with meaning of the mensuration, in Riemann’s sense of the word, of the four-dimensional continuum of space-time. 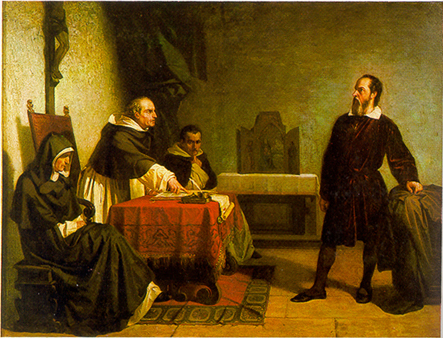 The question whether the structure of this continuum is Euclidean, or in accordance with Riemann’s general scheme, or otherwise, is, according to the view which is here being advocated, properly speaking a physical question which must be answered by experience, and not a question of a mere convention to be selected on practical grounds. Riemann’s geometry will be the right thing if the laws of disposition of practically-rigid bodies are transformable into those of the bodies of Euclid’s geometry with an exactitude which increases in proportion as the dimensions of the part of space-time under consideration are diminished. It is true that this proposed physical interpretation of geometry breaks down when applied immediately to spaces of sub-molecular order of magnitude. But nevertheless, even in questions as to the constitution of elementary particles, it retains part of its importance. For even when it is a question of describing the electrical elementary particles constituting matter, the attempt may still be made to ascribe physical importance to those ideas of fields which have been physically defined for the purpose of describing the geometrical behaviour of bodies which are large as compared with the molecule. Success alone can decide as to the justification of such an attempt, which postulates physical reality for the fundamental principles of Riemann’s geometry outside of the domain of their physical definitions. It might possibly turn out that this extrapolation has no better warrant than the extrapolation of the idea of temperature to parts of a body of molecular order of magnitude. 2. The universe is spatially finite. This must be so, if there is a mean density of the ponderable matter in universal space differing from zero. The smaller that mean density, the greater is the volume of universal space. I must not fail to mention that a theoretical argument can be adduced in favour of the hypothesis of a finite universe. The general theory of relativity teaches that the inertia of a given body is greater as there are more ponderable masses in proximity to it; thus it seems very natural to reduce the total effect of inertia of a body to action and reaction between it and the other bodies in the universe, as indeed, ever since Newton’s time, gravity has been completely reduced to action and reaction between bodies. From the equations of the general theory of relativity it can be deduced that this total reduction of inertia to reciprocal action between masses—as required by E. Mach, for example—is possible only if the universe is spatially finite. On many physicists and astronomers this argument makes no impression. Experience alone can finally decide which of the two possibilities is realised in nature. How can experience furnish an answer? At first it might seem possible to determine the mean density of matter by observation of that part of the universe which is accessible to our perception. This hope is illusory. The distribution of the visible stars is extremely irregular, so that we on no account may venture to set down the mean density of star-matter in the universe as equal, let us say, to the mean density in the Milky Way. In any case, however great the space examined may be, we could not feel convinced that there were no more stars beyond that space. So it seems impossible to estimate the mean density. But there is another road, which seems to me more practicable, although it also presents great difficulties. For if we inquire into the deviations shown by the consequences of the general theory of relativity which are accessible to experience, when these are compared with the consequences of the Newtonian theory, we first of all find a deviation which shows itself in close proximity to gravitating mass, and has been confirmed in the case of the planet Mercury. But if the universe is spatially finite there is a second deviation from the Newtonian theory, which, in the language of the Newtonian theory, may be expressed thus:—The gravitational field is in its nature such as if it were produced, not only by the ponderable masses, but also by a mass-density of negative sign, distributed uniformly throughout space. Since this factitious mass-density would have to be enormously small, it could make its presence felt only in gravitating systems of very great extent. Assuming that we know, let us say, the statistical distribution of the stars in the Milky Way, as well as their masses, then by Newton’s law we can calculate the gravitational field and the mean velocities which the stars must have, so that the Milky Way should not collapse under the mutual attraction of its stars, but should maintain its actual extent. Now if the actual velocities of the stars, which can, of course, be measured, were smaller than the calculated velocities, we should have a proof that the actual attractions at great distances are smaller than by Newton’s law. From such a deviation it could be proved indirectly that the universe is finite. It would even be possible to estimate its spatial magnitude. The usual answer to this question is “No,” but that is not the right answer. The purpose of the following remarks is to show that the answer should be “Yes.” I want to show that without any extraordinary difficulty we can illustrate the theory of a finite universe by means of a mental image to which, with some practice, we shall soon grow accustomed. First of all, an obervation of epistemological nature. A geometrical-physical theory as such is incapable of being directly pictured, being merely a system of concepts. But these concepts serve the purpose of bringing a multiplicity of real or imaginary sensory experiences into connection in the mind. To “visualise” a theory, or bring it home to one’s mind, therefore means to give a representation to that abundance of experiences for which the theory supplies the schematic arrangement. In the present case we have to ask ourselves how we can represent that relation of solid bodies with respect to their reciprocal disposition (contact) which corresponds to the theory of a finite universe. There is really nothing new in what I have to say about this; but innumerable questions addressed to me prove that the requirements of those who thirst for knowledge of these matters have not yet been completely satisfied. So, will the initiated please pardon me, if part of what I shall bring forward has long been known? Another example of an infinite continuum is the plane. On a plane surface we may lay squares of cardboard so that each side of any square has the side of another square adjacent to it. The construction is never finished; we can always go on laying squares—if their laws of disposition correspond to those of plane figures of Euclidean geometry. The plane is therefore infinite in relation to the cardboard squares. Accordingly we say that the plane is an infinite continuum of two dimensions, and space an infinite continuum of three dimensions. What is here meant by the number of dimensions, I think I may assume to be known. Now we take an example of a two-dimensional continuum which is finite, but unbounded. We imagine the surface of a large globe and a quantity of small paper discs, all of the same size. We place one of the discs anywhere on the surface of the globe. If we move the disc about, anywhere we like, on the surface of the globe, we do not come upon a limit or boundary anywhere on the journey. Therefore we say that the spherical surface of the globe is an unbounded continuum. Moreover, the spherical surface is a finite continuum. For if we stick the paper discs on the globe, so that no disc overlaps another, the surface of the globe will finally become so full that there is no room for another disc. This simply means that the spherical surface of the globe is finite in relation to the paper discs. Further, the spherical surface is a non-Euclidean continuum of two dimensions, that is to say, the laws of disposition for the rigid figures lying in it do not agree with those of the Euclidean plane. This can be shown in the following way. 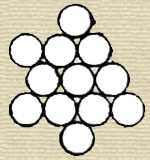 Place a paper disc on the spherical surface, and around it in a circle place six more discs, each of which is to be surrounded in turn by six discs, and so on. If this construction is made on a plane surface, we have an uninterrupted disposition in which there are six discs touching every disc except those which lie on the outside. On the spherical surface the construction also seems to promise success at the outset, and the smaller the radius of the disc in proportion to that of the sphere, the more promising it seems. But as the construction progresses it becomes more and more patent that the disposition of the discs in the manner indicated, without interruption, is not possible, as it should be possible by Euclidean geometry of the the plane surface. In this way creatures which cannot leave the spherical surface, and cannot even peep out from the spherical surface into three-dimensional space, might discover, merely by experimenting with discs, that their two-dimensional “space” is not Euclidean, but spherical space. We must try to surmount this barrier in the mind, and the patient reader will see that it is by no means a particularly difficult task. For this purpose we will first give our attention once more to the geometry of two-dimensional spherical surfaces. 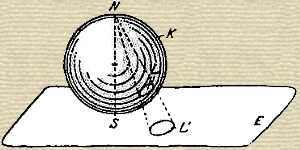 In the adjoining figure let K be the spherical surface, touched at S by a plane, E, which, for facility of presentation, is shown in the drawing as a bounded surface. Let L be a disc on the spherical surface. Now let us imagine that at the point N of the spherical surface, diametrically opposite to S, there is a luminous point, throwing a shadow L′ of the disc L upon the plane E. Every point on the sphere has its shadow on the plane. If the disc on the sphere K is moved, its shadow L′ on the plane E also moves. When the disc L is at S, it almost exactly coincides with its shadow. If it moves on the spherical surface away from S upwards, the disc shadow L′ on the plane also moves away from S on the plane outwards, growing bigger and bigger. As the disc L approaches the luminous point N, the shadow moves off to infinity, and becomes infinitely great. Now we put the question, What are the laws of disposition of the disc-shadows L′ on the plane E? Evidently they are exactly the same as the laws of disposition of the discs L on the spherical surface. For to each original figure on K there is a corresponding shadow figure on E. If two discs on K are touching, their shadows on E also touch. The shadow-geometry on the plane agrees with the the disc-geometry on the sphere. If we call the disc-shadows rigid figures, then spherical geometry holds good on the plane E with respect to these rigid figures. Moreover, the plane is finite with respect to the disc-shadows, since only a finite number of the shadows can find room on the plane. At this point somebody will say, “That is nonsense. The disc-shadows are not rigid figures. We have only to move a two-foot rule about on the plane E to convince ourselves that the shadows constantly increase in size as they move away from S on the plane towards infinity.” But what if the two-foot rule were to behave on the plane E in the same way as the disc-shadows L′? It would then be impossible to show that the shadows increase in size as they move away from S; such an assertion would then no longer have any meaning whatever. In fact the only objective assertion that can be made about the disc-shadows is just this, that they are related in exactly the same way as are the rigid discs on the spherical surface in the sense of Euclidean geometry. We must carefully bear in mind that our statement as to the growth of the disc-shadows, as they move away from S towards infinity, has in itself no objective meaning, as long as we are unable to employ Euclidean rigid bodies which can be moved about on the plane E for the purpose of comparing the size of the disc-shadows. In respect of the laws of disposition of the shadows L′, the point S has no special privileges on the plane any more than on the spherical surface. Let us imagine a point S of our space, and a great number of small spheres, L′, which can all be brought to coincide with one another. But these spheres are not to be rigid in the sense of Euclidean geometry; their radius is to increase (in the sense of Euclidean geometry) when they are moved away from S towards infinity, and this increase is to take place in exact accordance with the same law as applies to the increase of the radii of the disc-shadows L′ on the plane. After having gained a vivid mental image of the geometrical behaviour of our L′ spheres, let us assume that in our space there are no rigid bodies at all in the sense of Euclidean geometry, but only bodies having the behaviour of our L′ spheres. Then we shall have a vivid representation of three-dimensional spherical space, or, rather of three-dimensional spherical geometry. Here our spheres must be called “rigid” spheres. Their increase in size as they depart from S is not to be detected by measuring with measuring-rods, any more than in the case of the disc-shadows on E, because the standards of measurement behave in the same way as the spheres. Space is homogeneous, that is to say, the same spherical configurations are possible in the environment of all points.1 Our space is finite, because, in consequence of the “growth” of the spheres, only a finite number of them can find room in space. In this way, by using as stepping-stones the practice in thinking and visualisation which Euclidean geometry gives us, we have acquired a mental picture of spherical geometry. We may without difficulty impart more depth and vigour to these ideas by carrying out special imaginary constructions. Nor would it be difficult to represent the case of what is called elliptical geometry in an analogous manner. My only aim to-day has been to show that the human faculty of visualisation is by no means bound to capitulate to non-Euclidean geometry. 1. This is intelligible without calculation—but only for the two-dimensional case—if we revert once more to the case of the disc on the surface of the sphere. Photo added (not in original). Text and diagrams from Albert Einstein, translated by G. B. Jeffery and W. Perrett, Sidelights on Relativity (1923).